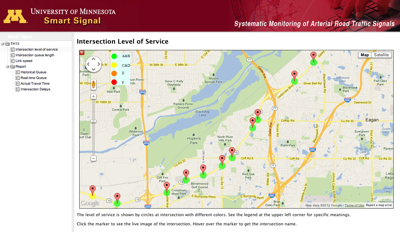 “Based on research from the University of Minnesota, SMART Signal Technologies, Inc., will commercialize a system to better predict and manage the flow of traffic on roads controlled by traffic lights. The system could potentially cut down on traffic congestion and help drivers save both time and fuel. I have talked about this before. I hope it gets widely deployed, what we don’t know about travel times arterials in real-time is embarrassing. “Although measuring and archiving freeway traffic performance using commonly available loop detector data has become a norm for many transportation agencies, similar approaches for urban arterials do not exist. In practice, operational data from traffic signal systems are neither stored nor analyzed, which prevents proactive management of arterial streets. The development of the SMART-Signal (Systematic Monitoring of Arterial Road Traffic Signals) system fills in this gap. The SMART-Signal system simultaneously collects event-based high-resolution traffic data from multiple intersections and generates real-time arterial performance measures including intersection queue length and arterial travel time. The development of the system has laid the groundwork for better traffic models and control strategies and opens up entirely new opportunities for managing traffic on congested roads. In the SMART-Signal system, a complete history of traffic signal control, including all vehicle actuation events and signal phase change events, are archived and stored. At each intersection, an industrial PC with a data acquisition card is installed inside the controller cabinet, and event data collected at each intersection are transmitted to the data server in real-time using an Ethernet connection. Using the event-based data, a set of arterial performance measures, especially intersection queue length and arterial travel time, can be estimated. SMART-Signal uses a newly developed algorithmic approach to queue length estimation based on traffic shockwave theory. Cyclic traffic shockwaves at an intersection can be reconstructed using event-based data, allowing for queue length estimation even when the queue of cars extends beyond the upstream vehicle detector. To measure travel time, SMART-Signal simulates the movements of a virtual “probe vehicle” along the arterial road. As the virtual probe moves, it can modify its own state in response to the state of traffic around it by accelerating, decelerating, or maintaining a constant speed at each time step as it encounters queues, traffic signals, and changes in traffic density. SMART-Signal can also optimize traffic signal parameters using the collected high-resolution data. Instead of relying on traditional offset optimization approaches, which are based on manually collected volume data on a typical day, SMART-Signal can account for traffic flow variations by using archived traffic signal data and the derived performance measures. [Note to jargon-heads, naked streets = shared space]. 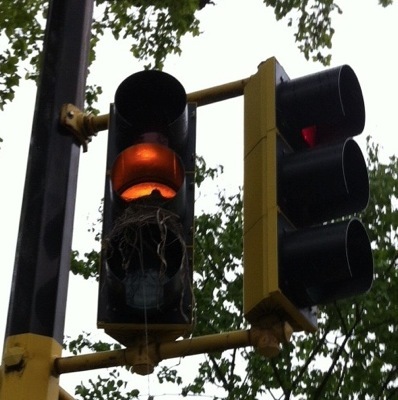 The picture is sort of difficult to see, but a bird family seems to think this traffic light (Franklin and Seymour) is a good nest site. This is not an unknown phenomenon. I would think the lights going on and off 24 hours a day would be annoying, but the rent is cheep. If you’re wondering how road traffic’s gonna slow you today, don’t turn to Google Maps anymore—the site’s killed its estimates. Not because it wasn’t popular. It turns out those road calculations didn’t exactly correlate to, you know, reality. The Atlantic describes the discovery of perturbed Maps users, who complained to Google when they noticed the change. Its answer? A big defeat for the biggest information provider. But using in-vehicle GPS on mobile phones as a probe is coming, and will eventually get it right (approximately, if lagged). The problem of course is that traffic is dynamic, and even a 5 minute lag will be quite off if there is an incident or something non-steady state. However as a signal of whether things are normal, it probably works. Information provision is probably best for what an individual will not know from routine behavior—random incidents and unfamiliar territory. The qualitative conclusion that incidents and the unexpected are where the greatest gains from traveler information are to be found reinforces the results from our simulations. Those models show that a low level of probes can provide useful information by rapidly detecting incidents, whereas a much greater number is needed to provide any gains from recurring congestion. A yearlong experiment with America’s electric grid could mess up traffic lights, security systems and some computers — and make plug-in clocks and appliances like programmable coffeemakers run up to 20 minutes fast. I have long thought there should be a time stamp on the electric grid power signal, something quite small, but that could be read as embedded information (some highly non-random sequence) from modulation of the phase or frequency of the AC cycle. Other means for synchronizing clocks rely on other networks (internet, GPS, radio, etc. ), some old discussion here. This is similar to the idea of powerline modems, but not nearly as sophisticated (i.e. I just want a time signal). Policemen on the street, on the other hand, are vastly more invasive and potentially unjust because they are surveiling you when you are not breaking the law, have the ability to bust you on more severe charges emanating from a traffic stop (e.g. if you have drugs in the car), have fallible judgment about whether you were in the intersection, and have the ability to enforce the law selectively (e.g. racial profiling). If privacy is your concern it would actually be far better to have RLCs, but ban police from the streets. If you concede that it is kosher to have policemen on patrol I see little basis for arguing against RLCs, which are actually considerably more benign. A major problem for RLCs is common to many public policies: those who are punished know who they are, but the beneficiaries do not. Also, it is hard to point to the benefits of something not happening. People who get tickets from RLCs are often bitter, and can turn into vocal enemies of the program. However, there are hundreds of people walking around today whose lives were saved by an RLC but will never know that they cheated death thanks to a camera. Consider that you might be one of them. Or if you really do hate RLCs, I’d suggest you fight back and teach those money-grubbing bureaucrats a lesson… by stopping at each and every red light. Alas they are unconstitutional in Minnesota.